The 5-day RYA Competent Crew course is a sail cruising course for beginners and those who would like to become active crew members of a sailing yacht rather than just passengers. The course lasts 5 days. Open group courses normally run from Monday to Friday. If you have done the Start Yachting course, you can complete the Competent Crew course in 3 days. Here’s what you need to know about The Boat School RYA Competent Crew courses.. The sailing boats we use for training on Competent Crew courses are specially equipped for sail training. Their sail plan means we can run sail courses even in light airs. All our vessels are commercially coded and inspected by the RYA. The 5-day RYA Competent Crew course is a sail cruising course for beginners and those who would like to become active crew members of a sailing yacht rather than just passengers. The course lasts 5 days. Open group courses normally run from Monday to Friday. 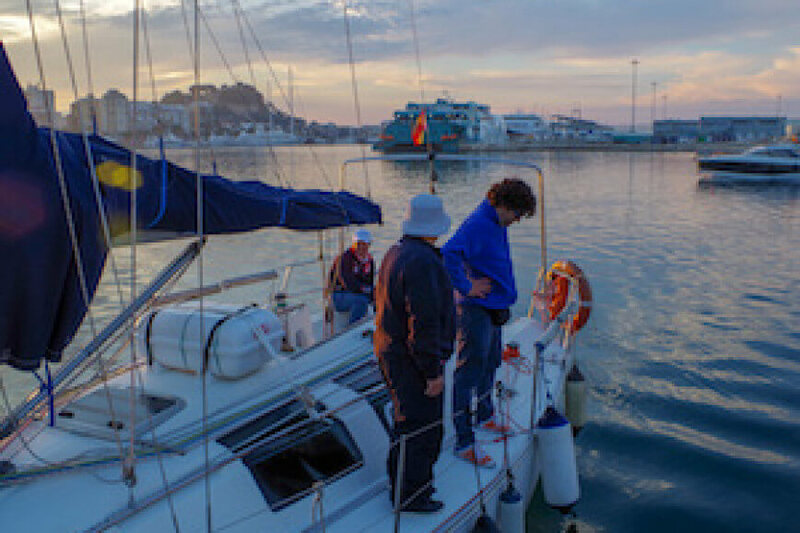 If you have done the Start Yachting course, you can complete the Competent Crew course in 3 or 4 days. The Boat School course to obtain the RYA Competent Crew certificate is taught in small groups with a maximum of five students. The Boat School’s five-day RYA Competent Crew course aims to provide beginners with a thorough introduction to sail cruising. This course requires no previous sailing experience. Virtually all the course is hands on. You are the crew – without you the sails won’t go up and the boat won’t be steered! By the end of the course you should have all the basic skills you need to be an active and useful crew member on a sailing yacht. When you finish the course, you should be able to steer, handle sails, keep a lookout, row a dinghy and assist in all the day to day duties on board. Please note that this is not a skipper’s licence; with the RYA Competent Crew certificate, you won’t be able to charter or skipper a yacht without a qualified person on board. We publish regular course dates all year round and you can book the course directly online. If you don’t find the dates you’re looking for on our training calendar, please contact us; we schedule courses in accordance with the availability of students interested in the course. The RYA Competent Crew course can be combined with other RYA courses in the sail cruising scheme. This means that you can choose a rental and course pack and have, for example, two participants preparing for the Competent Crew certificate and two candidates preparing for Day Skipper. If you already own a yacht, or if you have a friend who owns a sailboat, we’re more than happy to run an RYA Competent Crew course on your own boat. This option is significantly cheaper than open groups and charters; however, you do need to make sure that your boat is up to the standard required by the RYA for training. There is no minimum age to participate in the course; however, we only run this course for under 16’s if the parent or guardian is taking the course at the same time. You won’t need a medical certificate but you should be in reasonable physical shape. If you choose to book a place on an open group, we’ll put a maximum of four other people on your course. Click on the “Book Now” link to get course dates. We run RYA Competent Crew courses at least once a month all year round. If you don’t see the dates you want, please contact us and we’ll try to make a group. Please us the contact form below if you’re interested in chartering one of our sailing yachts and running the course during a holiday. If you’re a boat owner (or if friends have a sailboat), you can also choose own boat tuition for maximum flexibility for small group tuition (up to 5 students) or one-to-one training. Please contact us by completing the form below if you’d like to run a course on your boat.